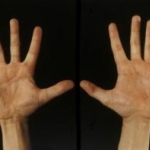 This is a characteristic body shape where the individual is tall and slight, with long limbs and digits, seen in Marfan's syndrome, a connective tissue disorder. Unlike Marfan's syndrome, the marfanoid habitus seen in MEN2b is not associated with aortic aneurysms or dislocated lenses in the eye. these are small benign tumours of nervous tissue found in the mucosa of the body (e.g. the linings of the nasal sinuses, the respiratory tract, the gastrointestinal tract, the biliary tract and the pancreatic systems). They are treated conservatively, removed only if they cause problems (e.g. by obstruction airways or the passage of food). This is where nerves going to the cornea at the front of the eye become enlarged and thickened. Little can be done about this. this is where the large intestine becomes enlarged and dilated due to a problem with the nerves supplying the gut. If the gut is not moving faeces properly through itself, it can become distended. This can lead to perforation of the colon if left untreated (toxic megacolon).